The renowned IACP Cookbook of the Year—now in paperback! What makes a book so special and deserving that it gets chosen cookbook of the year? It's the wealth of information, the experienced voice, the eagerness to share. Celebrated pastry chef Regan Daley unravels the mystery of the baking process, explaining the "how" and "why" behind the components that go into making the perfect dessert, and provides the tools and information home bakers need to create delicious recipes of their own—in their own sweet kitchens. Regan shows us that anyone, from complete culinary virgins to accomplished dessert-makers, anyone can make a fantastic dessert. The secret is in the ingredients. Her more than 140 original recipes, straightforward enough for any home baker to prepare, focusing on simple techniques with an emphasis on high-quality ingredients, range from the awfully impressive, Guava Cheesecake or Quince and Brioche Bread Pudding with Dried Sour Cherries, to the familiar—Really, REALLY Fudgey Brownies or World's Sexiest Sundae. 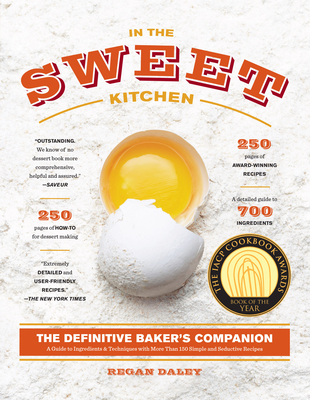 "Daley's International Association of Culinary Professionals (IACP) Award winner is the definitive guide to all the equipment, techniques, and indgredients a baker uses."